A small church in West Seattle had to find a creative way to survive the rising costs of the city. Shaun Mattson is lead pastor of West Seattle Church of the Nazarene, located on Juneau Street. His father was the pastor before him, back in the 90s. “I grew up playing hide and go seek here, running around, loving this place,” Mattson said of the church, which was built in the early 1900s. But as he grew up, the building began to show its age. Now, it’s seen better days as peeling paint marks the exterior. Mattson says the deterioration came to a head about five years ago. Condos under construction with the plans. Mattson said the cost of relocating in Seattle was so prohibitive they would likely have shuttered the 60 member church. It led them to make a difficult choice – selling the churchyard next door for a developer to build six townhomes and a public park. The proceeds will cover the church’s much-needed renovations. The homes were designed with community input, too. “Just do some of those things that would help us to continue to open this building to the community,” he said. For Mattson – the process has been a lesson in faith. Sometimes, he’s learned, you have to build that door yourself. Or, six of them. He's got a special investment in the project - he and his family live right next door. 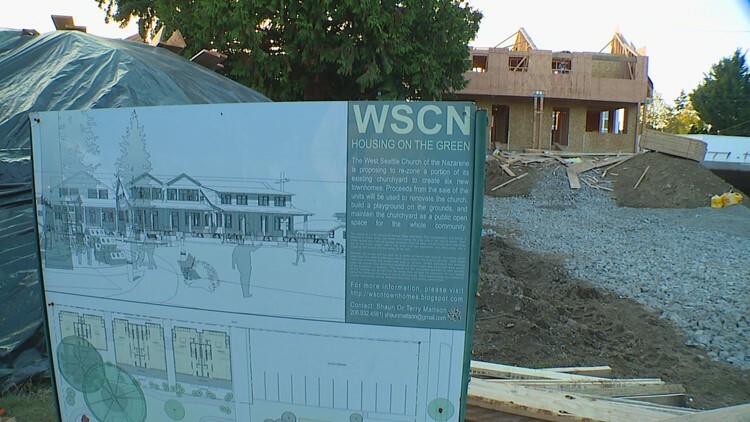 The townhomes could be complete by early next year.